There’s a new President in Latin America, and his name isn’t Nicolás Maduro. The election that brought him to power was called by an illegitimate regime following a coup d’etat, and his name isn’t Porfirio Lobo. He’s a wealthy, conservative businessman, and his name isn’t Sebastián Pi?era. His party ruled for over 60 years, and his name isn’t Enrique Pe?a Nieto. Horacio Cartes is his name, and he was elected President of Paraguay on April 21. His party, the conservative Colorado (ANR-PC) party, governed Paraguay for 61 years. During 35 of those years, from 1954-1989, dictator Alfredo Stroessner was the party’s leader. Cartes represents rich new blood in the sagging veins of the old party. According to Spanish newspaper El Pais, even though voting is mandatory in Paraguay, Cartes had never once voted before running for president, and only recently joined the party. “What Cartes brought to the party was the soundness of his immense fortune, built on the tobacco industry, and his experience as a shareholder in 25 companies with 3,500 employees,” reported the Spanish daily on the day of his election. School of the Americas Watch, which sent a delegation to observe the elections, expressed concern at Cartes’ sympathy for the dictatorship, his public disdain for queer people, and his seemingly totalitarian aspirations. Cartes’ link to drug traffickers was reported in the New York Times, and his implication in money laundering has been amply documented. “Through the utilization of a [Drug Enforcement Administration] [Buenos Aires Country Office] cooperating source and other DEA undercover personnel, agents have infiltrated CARTES’ money laundering enterprise, an organization believed to launder large quantities of United States currency generated through illegal means, including through the sale of narcotics, from the [Tri-Border Area of Argentina, Paraguay, and Brazil] to the United States,” according to a State Department cable leaked by Wikileaks. ?As if that wasn’t enough, a recent report by the International Consortium of Investigative Journalists revealed that a bank owned by Cartes opened a secret locale in the offshore tax-haven of the Cook Islands. Various acts of corruption were documented in the run-up to and on the day of the election. Though the Organization for American States applauded the elections as peaceful and transparent, their observers noted incidents of vote-buying and coercion on election day, as well as the use of questionable polls in the lead up to the election. 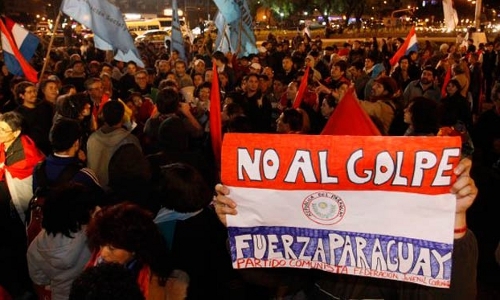 The major scandal leading up to the elections was the government’s purchase of lands linked to family members of the head of Paraguay’s national congress, a member of the National Union of Ethical Citizens (UNACE), who promised votes for the then-ruling Liberal party in return. After his removal on June 22, Lugo, a progressive former bishop and leader of an independent party, was replaced by Federico Franco of the Liberal Party. The US and Canada immediately recognized Franco’s government as legitimate, while South American trade block MERCOSUR (Argentina, Bolivia [membership in process], Brazil, Paraguay, Uruguay, Venezuela) suspended Paraguay following the coup. Irala explained that the Paraguayan left has long had a close relationship with progressive political parties, which in this case may have worked to its demise. Regardless, campesino movements and land defense struggles continue in an increasingly repressive environment. “Since 2004 we’ve been living through a period of the criminalization of social struggles,” said Irala. “Every time there’s new elements, first repression for repression’s sake, then there was another strategy which consisted of the accusation of campesinos, in one year more than 1000 campesinos were accused… From there we’ve passed to a new tactic, which is selective assassination.” Since the June 2012 coup, three peasant leaders have been murdered, all of them shot down by gunmen on motorcycles using assault rifles. Land conflicts are likely to continue in Paraguay. Cartes has expressed his support of a development model based on the extractive industries and said he’d like his country to be more like the United States. In addition to struggles against unfair land distribution fuelled by industrial farming and large scale ranching, protests against Canadian aluminium giant Alcan are ongoing, and oil discoveries in the Chaco region, announced in November, could provoke resistance from land based communities.